Oh Nelly, your picture is really sweet. I like it. That´s "Das Milka-Pferd"(the title). The meaning is "milka horse. " "Milka" is a chocolate company from Gemany. It´s my birthday present from Nelly. I love it. Aaaaah, sooo cute! I especially love the third one. 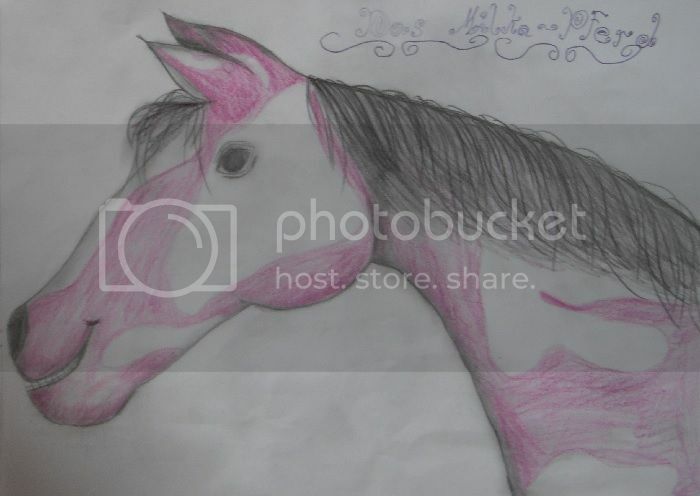 Great how you can draw horses in a way that really shows their mood, Nelly! I wish I could do that. Nora says she thinks it's very cool, too. Your Picture is nice too . Very lovely, Nelly! Such cute and friendly horses The grooming picture is wonderful! Thank you!!!! I like the grooming picture mostly too. This are the pictures that I wanted earlier upload into the forum. Wow, cooooooooooooooooool Nelly. The pictures are very nice. Have you drawn the spiders? They look so cool . Our art to draw animals is so different and I don't usually like the blurred shadows, but at the spider there is it better to see where it walks. Whether it is close to ground or far away to it. I love your art, bye and big hug. Thank you very much for the compliment . The spiders have I all alone drawn!! Wow, that last spider is amazing! I love the fact that you even used shade in the legs, it's as if you can see all the joints, very creepy! I'm also amazed by your drawing with the two horses with one horse resting his chin on the others neck. Their posture and eyes are so realistic, so lifelike, they're exactly like Blacky and Sjors when they are playing/being annoying together. Yesterday Nelly visited us and while Nora was drawing, we were discussing about drawing - whether it was the end of the world when a drawing did not look nice and whether this should keep you from experimenting altogether. Sometimes Nelly still tends to avoid trying difficult things, saying that she cannot do it anyway. 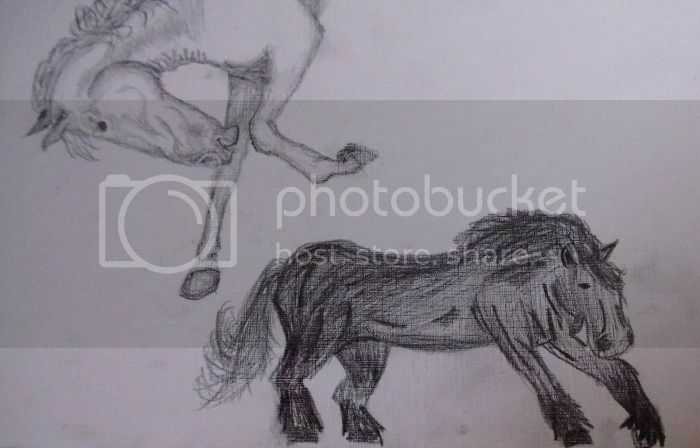 Well, after a while she wanted to try, so here is her first experiment of drawing less carefully (the upper horse is an old drawing by Nora). I think it's wonderful, especially how she tried to get movement into the horse. In the beginning using the pencil more boldly usually makes the drawings all dark, so the next step would be to use the shades of grey in a more differentiated way. Looking forward to our next experiments. Great job! There's definitely a lot of movement in the drawing, which makes it very alive and interesting. Keep going with your experiments!